You will receive an on-screen confirmation which details your booking reference and instructions. Please read these carefully and print the page for your records as you will need this information at the airport. A booking confirmation email will also be sent. Please ensure that your vehicle registration details are correct as this is used to give you access to the car park. There is an option to amend your booking if you will be arriving at the airport in a different vehicle than originally planned (see below). You are responsible for supplying a valid email and we cannot be held responsible for non-delivery of booking confirmation emails due to transmission failure or incorrect address details. Failure to receive the confirmation email has no bearing on the status of your booking. The booking is valid but please check your email junk or spam folder. Amendments may be made up to 24 hours before the booking commences by logging in to your account with the password received when the booking was made. If you have NOT BOOKED DIRECTLY with Exeter Airport and used one of the sales agents (eg Holiday Extras / Flybe) please contact them directly. PLEASE NOTE Only Premium Parking and Car Park 1 bookings with cancellation protection can be amended or cancelled. Amendments to the dates of stay are subject to the terms and conditions of your booking. Certain promotional products cannot be amended, it will be made clear at the point of booking if this is the case. Please note if you booked during a sale or at a lower price and that rate is no longer available, the new rate will apply. Where specified in the product details some special offer bookings cannot be amended or cancelled. If you have NOT BOOKED DIRECTLY with Exeter Airport and used one of the sales agents (eg Holiday Extras / Flybe) please contact them directly. PLEASE NOTE Only Premium Parking and Car Park 1 bookings with cancellation protection can be amended or cancelled. When you cancel your booking, a £7.50 administration charge will be levied and deducted from the refunded amount.The £7.50 administration charge will not apply if you chose to purchase the Cancellation Protection as part of your booking and are cancelling at least 24 hours prior to your car park arrival date. 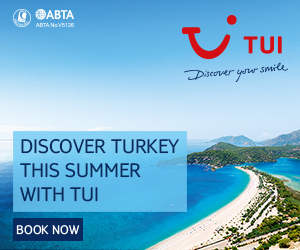 Bookings made less than 24 hours before departure cannot be cancelled and are non-refundable. What should I do if my booking reference is not recognised. If you are trying to amend or cancel your booking online via prebook.exeter-airport.co.uk and your booking reference is not recognised, it is likely that the booking has been made through a third-party site. If you have NOT BOOKED DIRECTLY with Exeter Airport and used one of the sales agents (eg Holiday Extras) please contact them directly. Can I make a booking TODAY and park at the airport today? Bookings can be made up to 2 hours prior to your arrival time at the airport. All Car Park bookings are subject to availability we reserve the right to withdraw availability at its entire discretion for a given date. You will be charged for the additional days in which you stay in the car park, based on the overstay rate applicable to the car park and Airport.For further details of these Overstay charges please refer to the terms and conditions on your booking confirmation or to ‘Section 6. Car Park Conditions of Use’ in the car parking terms and conditions on the Airport website. Overstay charges are only applicable if you leave the car park 6 hours after the departure date and time entered at time of booking. 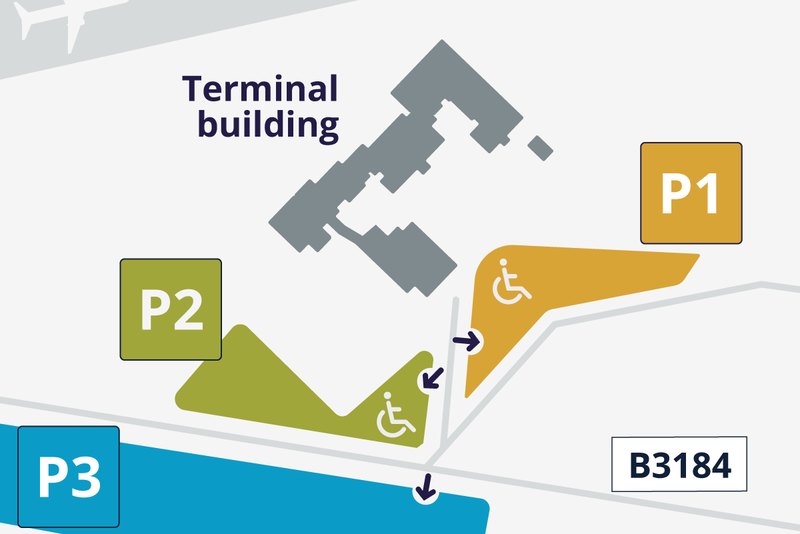 Blue Badge holders may use the Car Park P2 disability parking bays close to the terminal. Use the ‘call button’ (Passenger Assistance Point) at the P2 entry barrier. A disability parking bay will then be allocated. Special Assistance and help to the terminal may be requested at this time. If the Blue Badge is required at the destination, an Exeter Airport Disabled ticket should be obtained from the Car Park P2 Office. Passengers with Reduced Mobility who are not Blue Badge holders, may be advised to use Car Park 3 parking bays adjacent to the car park shuttle bus shelters. A free period for drop-off or pick-up is permitted in Car Park 1 for Blue Badge holders. Use the ‘call’ button (Passenger Assistance Point) at the entry barrier and display Blue Badge to request a free period and assistance if required. Use the ‘call’ button at the exit barrier to notify staff that you wish to exit the car park. Passengers booked into a Long Stay car park may use Car Park 1 for the unloading/loading of baggage free of charge. The request for a free period should be made by using the ‘call’ button. 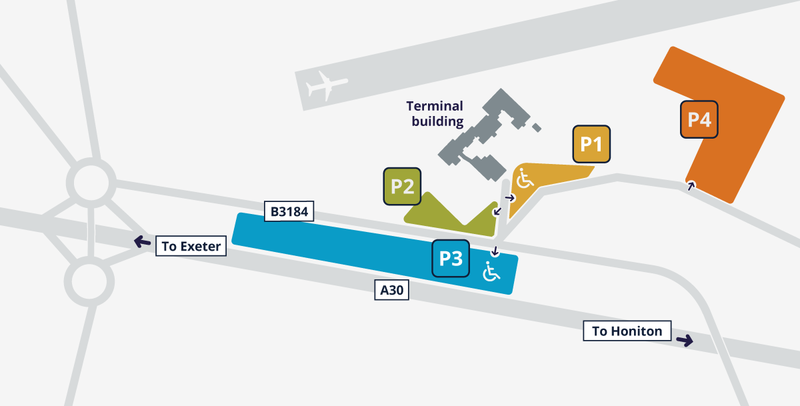 Car Park P1 has drop-off and pick-up bays opposite the Terminal. Please use a Pay Station (£1 = 30 mins) in the car park or in the Arrivals terminal before driving to the Exit barrier. Stopping is not permitted on airport terminal approach roads. Car Park P4 has a free 10 minute drop-off or pick-up period and passengers may use the on-demand complimentary shuttle bus service. The CAA monitors UK airport fees and charges and their analysis includes comparisons for Pick-up & Drop-off. Taxi drivers may apply for a Car Park 1 frequent user discount card at the Customer Service Office (Car Park 2). 1.1 These terms and conditions (“Terms”) apply to all bookings for services made via www.exeter-airport.co.uk and all url’s operated by Exeter and Devon Airport Limited (together referred to as the “Website”). In these terms and conditions “we”, “us” and “our” means Exeter and Devon Airport Limited. 1.2 The Website is owned by Exeter and Devon Airport Limited. 1.3 The word “you” our “your” refers to the driver or the person who booked parking in our car parks. The contract for car parking, priority security or lounges is made between you and Exeter and Devon Airport Limited. 2.1 Any contract made between you and us is governed by British law. 2.2 We reserve the right to change these Terms, but once you have made a booking the Terms which apply are those which were in place at the time of booking. 2.3 These Terms constitute the entire agreement between you and us with respect to the sale of the relevant services. 2.4 Each of these Terms and Conditions shall be construed separately, applying and surviving even if for any reason other provisions are held inapplicable or unenforceable in any circumstances. 2.5 The use of the car parks is regulated by Exeter Airport byelaws under which a penalty may be payable for failing to comply with these terms and conditions or the requirements of the relevant order or byelaw. 3.1 Car park booking quotes are valid at the time of booking only. 3.2 All prices shown are in British Pounds and include VAT at the current rate. 3.3 The car park charges are priced per period of 24 hours or part thereof. 3.4 The quote is based on the number of periods of 24 hours or ‘days’ and these are calculated on the basis of the times selected when making the booking. 3.5 If the entry and exit times change from that specified in the booking and the actual time in the car park runs into another 24 hour period, an additional day’s charge, at the tariff rate displayed at the entrance to the car park, will be required and this amount must be settled before leaving the car park. 3.6 Additional over-stay charges will apply irrespective of the reason unless a delayed return is caused by the negligence of the Exeter Airport. The parking fees payable are displayed on the tariff board at the car park entrance and at both the pay stations located in arrivals and Car Park 2. You are obliged to pay the fee and to comply with any instructions on the tariff board. 3.7 If you fail to collect your vehicle more than 30 days after the date which you have specified for exit in the booking, and we are not notified of the reason, then we will deem the vehicle to have been abandoned. In such circumstances we shall be entitled to remove and sell the vehicle and deduct from the proceeds both our reasonable handling expenses and any unpaid sums for days in which the car has been in the car park. 4.1 The booking is valid for the times, dates, price and car park specified in the booking. 4.2 The booking may be amended or cancelled free of charge, online at ‘Manage my Booking’, up to 24 hours prior to the booked arrival time. Cancellations after this point will not be considered. 4.3 Restricted discount deals cannot be cancelled once booked. 4.4 Where there is a reduction in the number of days booked, the change to the booking must be made at least 24 hours before scheduled arrival booked time. 4.5 If the change requires additional parking days, the extra days will be at the full daily rate. 4.6 No retrospective refunds will be made after the car park entry start date. 4.7 No refund will be made if a booking has not been redeemed for any reason or cancelled in accordance with the procedures. 4.8 Any days booked and left unused after the scheduled arrival booked time will not be refunded. 4.9 No refund will be made without a booking reference number. 4.10 Because of UK anti money-laundering regulations, refunds will only be made to the original card on which payment was made. 5.1 We will use all reasonable endeavours to ensure that our car parks are secure but you park at your own risk. 5.2 We will act with reasonable skill and care when providing services but our responsibility is limited and is that arising from our negligence or the negligence or dishonesty of our servants or agents. 5.3 We do not accept liability for: a. the security of your vehicle and/or its contents. b. damage to the vehicle, whether caused accidentally or by way of vandalism. c. indirect or consequential loss of profit, enjoyment, revenue, data or earnings. d. any failure by us to perform obligations due to an event beyond our reasonable control. 5.4 If the equipment in the car park is damaged by you, your vehicle or the passengers in the vehicle then, except where the damage arises from our negligence, we will seek to recover the cost of that repair and associated administration costs from you. 5.5 If your vehicle sustains damage while in the car park or if you lose your vehicle or any of your possessions from your vehicle you should immediately inform a member of staff at the car park customer service office. 5.6 Any damage to another customer’s vehicle caused by you should be reported to the car park customer service office. You must also notify the owner of the other vehicle by leaving a note on the windscreen of their vehicle providing your vehicle and contact details and any other details that are relevant to the incident. 6.1 Ensure that when leaving your vehicle it is securely locked and all of the windows are securely closed. If your vehicle is fitted with a vehicle alarm, steering lock, or similar device, it should be engaged. See section 5.3 6.2 If leaving possessions in your vehicle they should be in the boot or in a secure out-of-sight storage area. See section 5.3 6.3 The CCTV cameras installed in our car parks are used to assist in the running of the operation but we do not make any representation as to the extent of coverage provided and no guarantee is given as to the security of your vehicle. 7.1 An automatic number plate recognition (APNR) system will read the car registration at the entry barrier and the barrier will lift, allowing entry. 7.2 A car parking ticket may be issued and this may be required on exit. 7.3 At the end of the parking period the barrier will also lift to allow exit if the car has been parked within the time booked. 7.4 The vehicle must be driven carefully and responsibly in the car park and drivers should obey the directional and other signs. 7.5 The driver must park in the marked bays provided. 7.6 The driver should not park within a bay designated for a specific purpose when not entitled to do so. A disability space for example. 7.7 We reserve the right to move vehicles using whatever method we consider appropriate to avoid obstruction or for the more efficient arrangement of our parking facilities. 7.8 All passengers and any animals in the vehicle must be supervised all times and children should be accompanied in the car park. 7.9 Caution should be exercised when on foot in the car park. 7.10 We reserve the right to refuse the admission of any vehicle to the car park. 7.11 We reserve the right to charge an excess fee for any vehicles using more than one car parking space at the rate of the current roll-up rate per stay day. 8.1 A complimentary shuttle bus service operates to and from designated car parks. 8.2 The shuttle bus can be called via the intercoms located in the bus shelters. 8.3 Shuttle bus shelters should be used when waiting for the service. 8.4 Transfer times from the car park to the terminal building are not guaranteed and we do not accept responsibility for any missed flight deadline due to any failure of this service. 8.5 The operator of the shuttle bus is not responsible for loading or unloading baggage into or from the stowage area. 9.1 No person shall, without the written consent of the owner of the car park, offer a service or skill in a car park to persons in or near the car parks. 9.2 In the event of vehicle breakdown you must contact the car park customer service office and ensure that any repair or removal is organised without disruption or danger. 9.3 No person shall without the written consent of the operator use any part of the car park for: a. sleeping or camping or cooking. b. the purpose of servicing or washing any vehicle or part thereof other than is reasonably necessary to enable that vehicle to depart. There are no vehicle height restrictions at the car park entrances and exits. Vehicle width restrictions are limited to our standard space size of 2.4m x 4.8m. Drivers of large and long wheelbase vehicles may use the car parks, but are advised that if their vehicle restricts the use of other car parking bays, the airport reserves the right to charge for the extra space. Please see terms and conditions: 7.5 The driver must park in the marked bays provided. 7.11 We reserve the right to charge an excess fee for any vehicles using more than one car parking space at the rate of the current roll-up rate per stay day.